There are places in Wales that are famous for their legends and ghost stories. 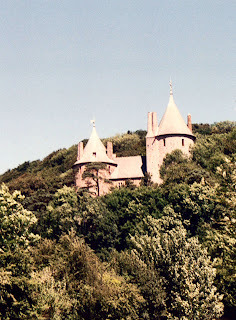 One such place is a fairy-tale castle near Cardiff in South Wales called, Castell Coch. This is one of my favourite places to visit in Wales, not only because it is less than an hour's drive away from my home, but also because its fairy-tale looks really get my imagination going. There is reputed to be not only the ghost of a woman looking for her son for all eternity, but also some form of magic that was cast way back in time, to protect valuable treasure in secret tunnels that lay below the castle. The story goes that a woman by the name of Dame Griffiths lost her son when he fell into a bottomless pit of water and was never seen again - how he didn't just float to the surface I have no idea, but with the ghostly unseen world who can really know? 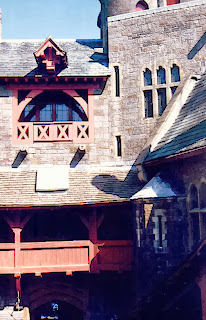 Anyway, the Dame was so grief-stricken that when she later died, her ghost became anchored to Castell Coch looking for her son for all eternity. She has often been seen by visitors wandering around the wooded grounds that surround the castle. But I have looked long and hard, and whilst my imagination can create a certain eerie feeling in the woods of Castell Coch, I have never seen Dame Griffiths at all. Not long after Dame Griffiths died or left the castle - I do not know which - another lady moved in with her two servants who were man and wife. The servants complained of hearing noises in the night, but their mistress dismissed their complaints to rats or other small wild animals entering the castle at night. One night however, the servant husband awoke to see a figure stood at the foot of their bed. It was a cavalier whose face was ashen and grief-stricken. According to one legend, this cavalier was grieving for a lost treasure that he had left in the secret tunnels beneath the castle, but died in battle before he could return to retrieve said treasure. The sight of this ghost proved too traumatic for the servants so they left Castell Coch leaving their lady mistress to fend for herself. Not long after, she felt she couldn't possibly manage without servants so she left also. Or did she see the ghost? Or was it that in those days, servants were considered a necessity? Another slant on this story is that there was a certain Welsh soldier called Ivor Bach who used witchcraft to turn two of his men into eagles and left them to guard the hidden treasure but also never returned due to being killed in battle. The story continues that after the lady had left Castle Coch, two local men decided to dig down into the tunnels in search of the treasure and eventually they found it with two eagles statues perched on the top. As they approached the treasure though, the eagles sprang to life and attacked the men chasing them out of the tunnels. Not to be thwarted by these eagles, the two men returned with guns, but their bullets had no effect on the birds who became even more aggressive and again chased them out of the tunnels. It is said that again they tried, and the same thing happened. This time they sealed the tunnels. I think I would have given up after the first time! Statues coming to life!? I am fascinated by ghostly phenomena, but demonic indestructible eagles that had the power to inflict pain? I wouldn't go that far! The eagles are still reputed to be in the tunnels to this day, but I wonder who is going to be brave enough to look for the tunnels or these crazed ghostly birds. Ghosts or no ghosts, I love this little patch of my homeland, and would definitely recommend Castell Coch to be anyone's list of places in Wales to visit.